I was shocked and amazed when I saw that I hit 1,000 followers on Instagram over the weekend. In honor of that milestone, I am hosting 2 giveaways. One will be on Instagram and one on this blog post! 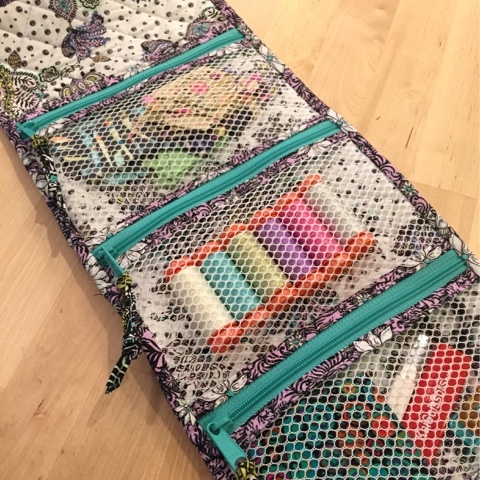 What better way to celebrate such a milestone than to do a giveaway that includes the pattern that really "started it all" so to speak, the A Place for Everything Bag. I've written about this bag on several occasions on my blog and on Instagram, and I really couldn't love this bag any more than I do. These are the 6 bags that I've made from the pattern! Before I get into the giveaway details, I'm going to have a super sappy moment and say thank you so very much to everybody that has been a part of this journey to 1,000 followers. There are a couple of people that I deserve extra thanks: Annie Unrein (creator of amazing bag patterns and Soft and Stable), Tula Pink, Katy Jones, and Teresa Silva, the three brilliant, amazingly talented ladies that have given me the opportunity to make the bags for them, and last, but certainly not least, and my family and friends for just being the people that you are. So, yeah, now we're moving on to the good stuff... You ready? 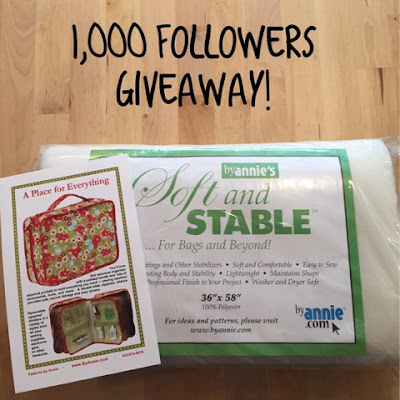 On the Instagram giveaway, I will be giving away a copy of my favorite pattern, the A Place for Everything Bag and a yard of Soft and Stable courtesy of Annie and her amazing team at byannie.com. 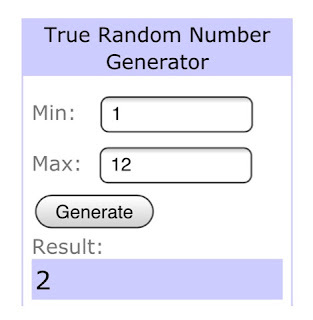 For my 2nd giveaway (on this post), I am doing an even BIGGER prize. In addition to winning a copy of the A Place by Everything Bag pattern and a yard of By Annie's Soft and Stable (also courtesy of Annie and her team), I am including a finishing kit for making the bag. 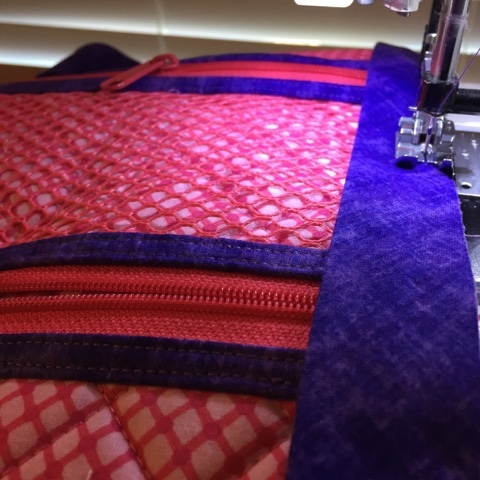 The kit includes the mesh, vinyl, and zippers that you will need to make my favorite bag. You may enter both giveaways, but you can only win once. 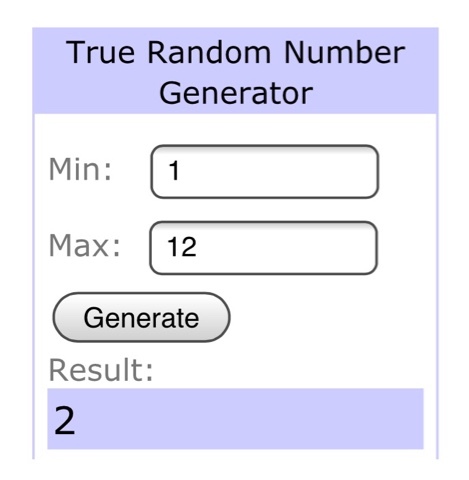 If the same winner happens to be selected by the random number generator, you will win the larger of the two prizes (the pattern + Soft and Stable + the finishing kit). To enter, please leave a comment and tell me either which fabric you might use or how you will use your bag (or both). **If you are commenting on this blog post, please make sure your email address is listed (if you are commenting with a Google/Blogger/whatever profile) or leave it in the comment so that I can get in contact with you. The giveaway will close at 9 PM Pacific Time (Midnight Eastern Time) on Saturday, August 15. I will send a direct message to the Instagram winner and an email to the blog winner to get your shipping addresses. Good luck to everybody, and thank you again to each one of you for being part of this journey. Congrats, Darcy! You will receive the pattern and a yard of Soft & Stable courtesy of Annie and a finishing kit from me so start planning! I'll email you shortly to get your color choices for the mesh/zippers and address! This is it! We are at the end of the road for the Sew Along. I think Annie's blog post is clear and concise. There's not much that I do differently except that I *do* press my binding. I tried not pressing it once, and it twisted more than the pressed binding, so your mileage may vary. In my list of tools that I use for making this bag, I mentioned the Binding Tool by TQM Products. The ruler has directions printed on the top that specify the amount of a tail that should be left to use the Binding Tool. With the amount of binding that is prepared in the instructions, there is more than enough needed to use the tool. 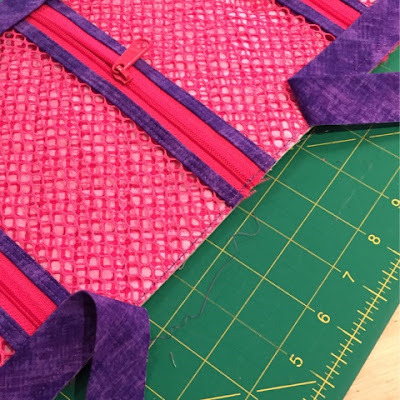 The big thing that seems to snag people up on the Binding Tool is that you need to leave the appropriate amount of gap between the start of the stitching attaching the binding and the end of the stitching. With the Mini size tool that I used for this project, I had to leave a 6" gap. 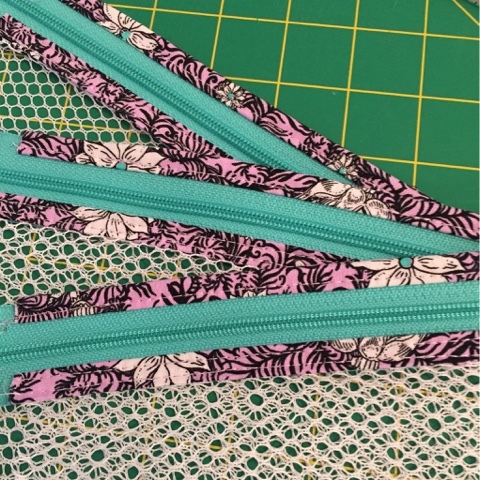 If the gap is too small or too large, the binding ends will not be cut to the appropriate length and the end results will not make you a very happy camper. 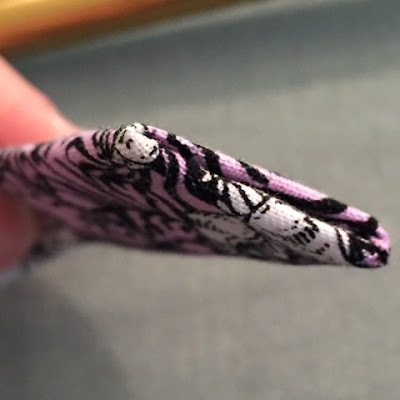 My general rule of thumb is to use a 1/4" seam allowance when attaching 2.25" binding (3/8" seam allowance with 2.5" binding). 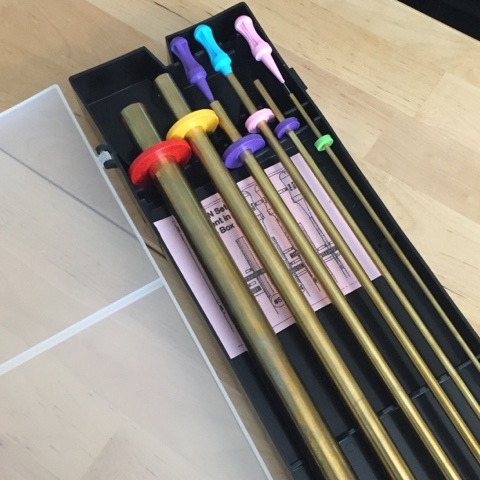 If I didn't love my TQM Binding Tool so much, I would probably use the method that Annie demonstrates in her blog entry. 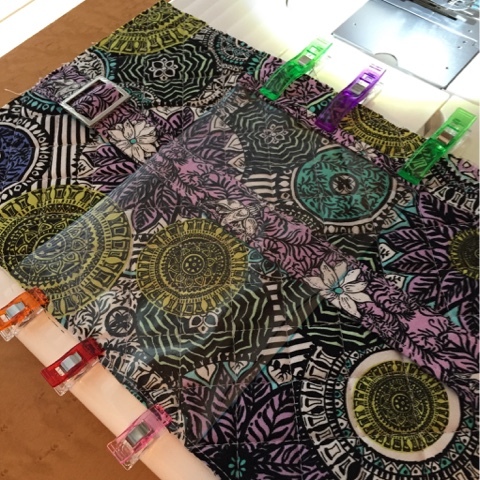 If you want to see more about how the Binding Tool works, you can check out the instructions on TQMproducts.com. Oh, how I love thee, Clover Wonder Clips! I don't always clip all the way around my project to hold the binding in place, but I like to do it when I'm working on a smaller project (or usually 1 or 1.5 sides of a quilt). I like the quick visual clues for seeing how much I've done (because I remove them as I go) and how much I have left to go. As I've said before, I prefer the look of hand finished binding. It takes more time than binding by machine, but the prettier finish beats the speed for me every time. The only part of hand binding the bag that was troublesome for me was stitching through the vinyl on the back of the bag. It's hard to see in the 2nd photo, but I was going through the vinyl in the picture. With a sharp needle, it's doable, but it is more painful (literally). Thankfully, the pocket isn't very large. As I mentioned previously, the first Stash and Dash bag (in the photo below) was the only one that I made with the vinyl pocket on the back.. I'll be honest and tell you that I'm not the biggest fan of the zipper pulls on this bag. I love them on my other Patterns by Annie bags, but I'm not as keen for using them on this particular bag. With the longer pulls on the handbag zippers, I don't think they are entirely necessary. I may leave them on mine, or I may untie them and stash them in a drawer just in case I change my mind in the future. So, with that said, if you are going to make them, I highly recommend using a bias tape maker. The strips start at 1" wide and finish at a mere 1/4", so there are many chances for people like me to give themselves multiple steam burns (hey, at least I'm realistic about the likelihood that it will happen to me AGAIN). On mine, I use 2 knots - the one that is created by pulling the ends of the fabric through the loop and another at the end of the pull. Once I'm satisfied with the length, I trim the ends of the fabric away leaving a 1/2" or so tail beyond the last knot and I brush Fray Block on the cut edges. 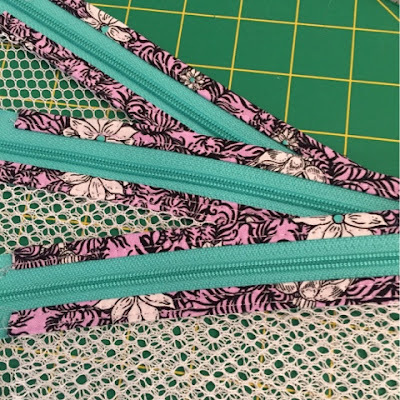 Cutting the fabric at a 45 degree angle leaves you with a bias edge that is resistant to fraying, but the ends of the thread can still start to come apart. The Fray Block helps to keep that pretty well minimized. I'm not going to pretend that I know what all of this electronics stuff is, but my husband says his Stash and Dash bag is perfect for holding it. So, that's it for me on part four of my recap (days 16-21 of the Sew Along). I hope that you may have learned some tips, laughed at my perpetual randomness, or gazed upon my posts in horror at my terrible attempts at photography. If you haven't done so, be sure to head over to Annie's blog and snag a copy of the free pattern (before October 1). 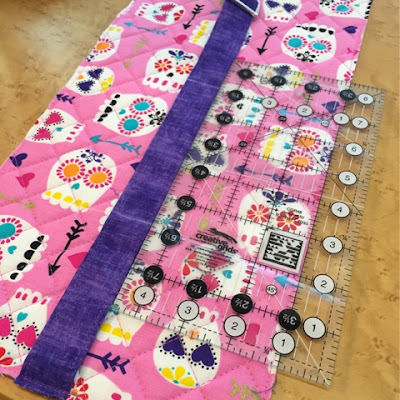 While you're there, check out the official Sew Along posts and be sure to keep up with what Annie is doing by following her via social media or signing up for her newsletter. Welcome back to Round 3 of my recap of the Stash and Dash bag Summer Sew Along! Making the vinyl pocket is pretty straight forward, and Annie's post will give you some great tips that will save you time and frustration. I find vinyl to be pretty easy to sew with once you learn the tricks. This is pretty redundant, but I really couldn't agree more about my Teflon/Non-Stick feet being worth the expense (mine have been $15-30 depending on the machine). The one in the picture is the Janome Ultraglide foot that fits my Juki TL-2010Q, and I have sewn a lot of the same vinyl with the Non-Stick foot on my Pfaff machines. If you're wondering why my picture looks a little weird, I had the extension table on my machine, and the vinyl was sticking to the plastic so I rotated it 180 degrees (the vinyl piece is small enough that it easily fit within the harp space of my Juki). The best tips that I can give you on this section are to make sure that your slider is facing the correct direction. With the metal slider that I used, there is a slight curve. You want to make sure that yours is oriented properly so that it will operate correctly once installed. This is just a side view showing how the strap works with the slider. The other tip that will save you a lot of frustration is to double check your line placement. As you can see in the picture below, I was double checking that my strap was positioned properly before stitching it down. This is also another time where Wonder/binding tape can be very useful. I put a line of tape on the center of my original seam from sewing the fabric tube. 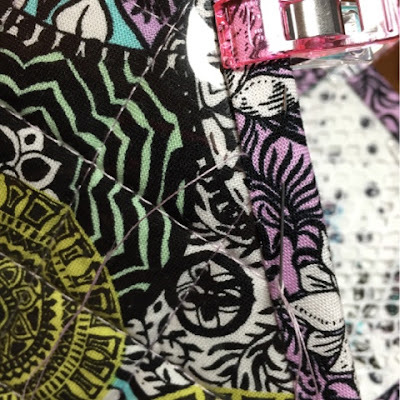 I left the tape short enough that it wouldn't cross my marked lines, but long enough that it would keep my fabric in place for easier stitching. I'm admittedly a super big fan of Clover Wonder Clips. While I use the small clips 99% of the time, the large size (they are usually green) is handy. On the left side of the picture, you can see that I've used the small size clips to hold the edge of the vinyl. The top/right side of the picture shows 3 large Wonder Clips holding the bound edge of the vinyl pocket in place for easier stitching. 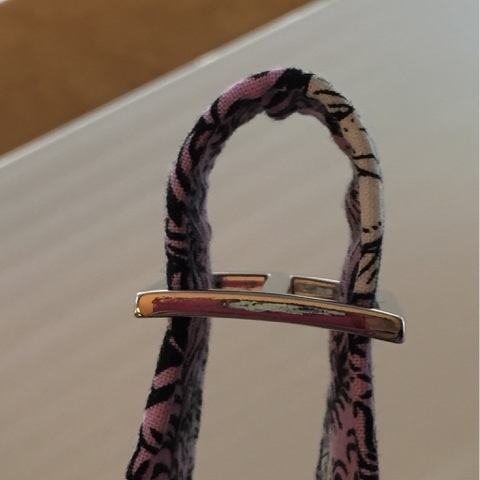 The large clips have a long enough reach to allow the fabric to remain flat. I will also note that for my purposes, I chose to omit the vinyl back pocket (except on the first bag that I made in the picture) because I didn't find that it was necessary for how I was planning to use the bags. The instructions were great, I just didn't need it. If I'm making a bag, with few exceptions, I will follow the directions as written. It's usually on bags 2 and on that I'll start making modifications. I think Annie's post covered this section really well. I will add that in my 3rd Stash and Dash bag, I opted to use vinyl pockets instead of mesh. 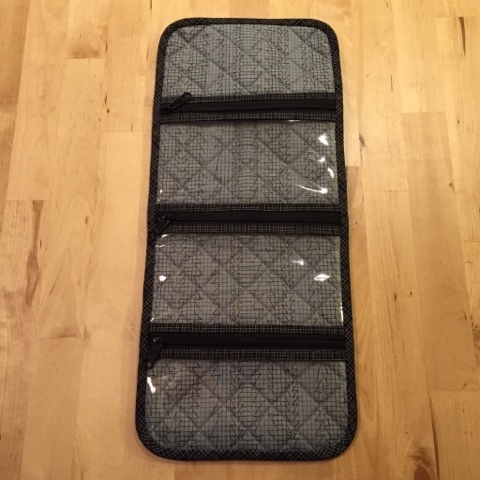 I was making the bag for my husband, and the mesh pockets wouldn't have worked very well for how he was planning to use the bag. I could have gone with a finer mesh, but it would have really obscured the view of the items. I cut the vinyl to the same size as the mesh, and I used the same method as described in the pattern to stitch it down to the bag (using my nifty Teflon/non-stick foot). In my next post which covers finishing the bag, I will share more pictures of how my husband is using his Stash and Dash bag. Here's the finished bag for my husband with the vinyl interior pockets. So, here's where the button templates that I mentioned in the first post of the series comes into play. I really like the spool of thread trick that Annie talks about, but I have about 7 or 8 different threads, and they all have different sizes of bases. I marked the template to indicate that it measured 2.5" across, so I don't have to continually re-measure every time I want to make something that requires a curve of that size. I use it frequently enough that I keep it in my A Place for Everything bag. 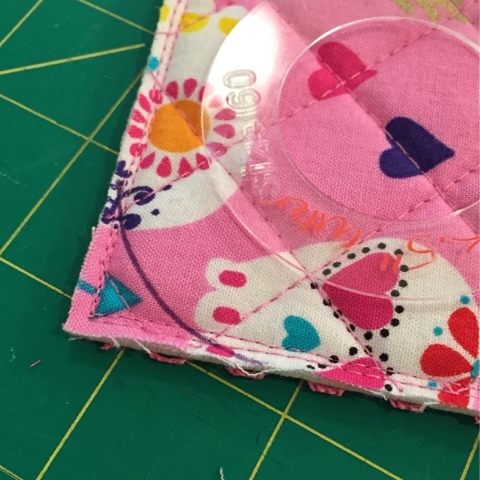 To make the correct size curve using these templates, you want the edge of the round object to kiss the edge of two sides of the fabric and mark the curve using an appropriate marking pen. For this project, I selected a purple Frixion pen because it would show well against the pink background of my fabric. I've also marked the same curve on dark fabrics where I used a white pencil. I don't often scissor-cut fabric unless I really have to do so, but I do use scissors to cut along the line that I've just marked. 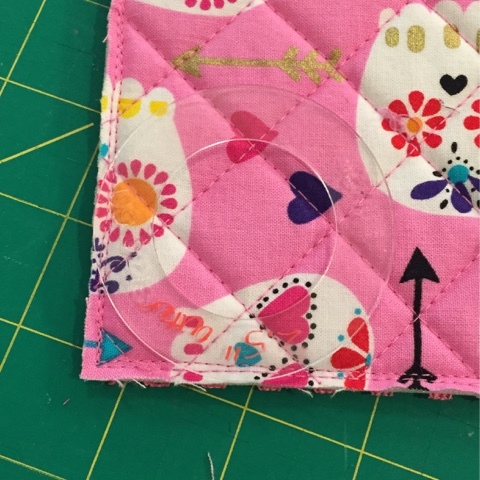 I don't worry about making sure the marks are totally removed (as I would do if the line would be visible,but for this purpose, the line is your cutting line and it will be hidden inside of your binding. With a line that is very visible against my fabric, it was a piece of cake for me to round the corners with scissors. So, that's it for me on part three of my recap (days 11-15 of the Sew Along). I hope you are having fun with this super fantastic little bag. I know that I have. I love them so much that I've already made 4 (as of when I'm writing this post), and I have 3 more to make as gifts. If you haven't done so, be sure to head over to Annie's blog and snag a copy of the free pattern (before October 1). 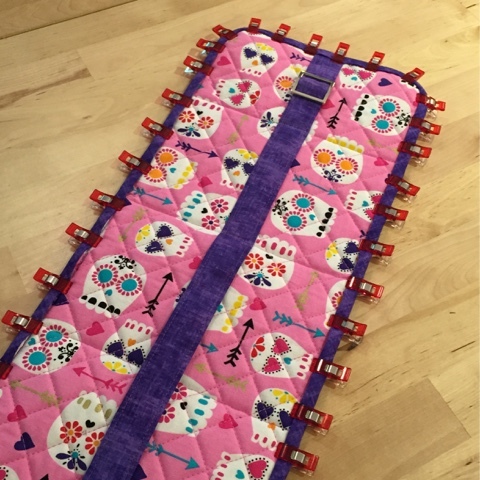 While you're there, check out the official Sew Along posts. Be sure to check back with me in a few days for more progress updates on this fantastic project. 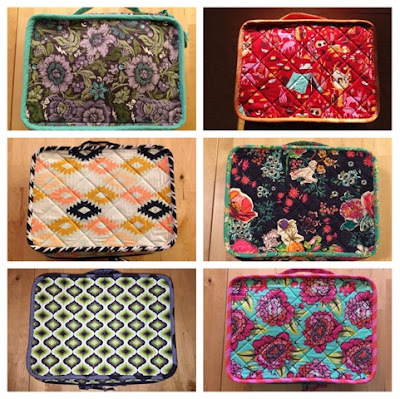 Welcome back to Round 2 of my recap of the Stash and Dash bag Summer Sew Along! As I mentioned in the first post, I love my tube turning set from Fasturn. It's a little bit different from the one that Annie uses, but the general idea is the same. Why do I love this set? The tubes are copper and sturdy. 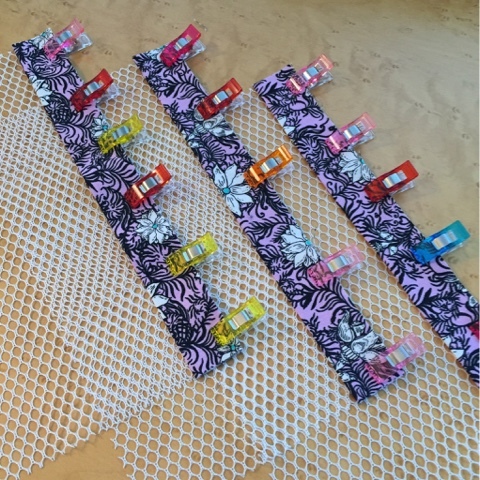 There are 5 different sizes to choose from to make a tubes including a super skinny tube for making spaghetti straps for garments. It comes in a hard plastic case for easy storage. 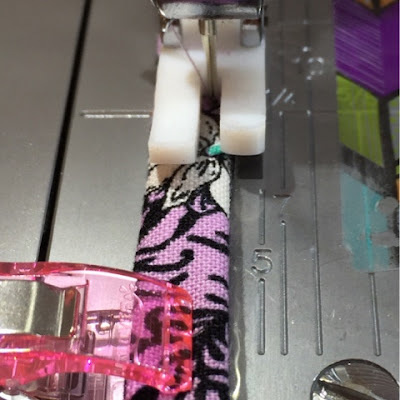 The other thing that I want to really note about this step is after you have the strapping/webbing fed into the tube, you want to turn the fabric back into the tube itself as you can see in my picture. I think Annie's post pretty much sums it up perfectly. I use a lot of handbag zippers with my projects, and I will often buy a longer zipper (plus extra pulls) than needed and cut it into several pieces. While I haven't seen it as often as with other products (thread, yarn, fabric,etc), I would rather have a single item to use throughout a project instead of having to deal with potentially different dye lots. I also have a few colors of zippers that tend to be my go to colors, so I find it to be more economical to purchase the Zippers by the Yard set from Annie's website. That way I can cut my zippers to the appropriate lengths for each project. 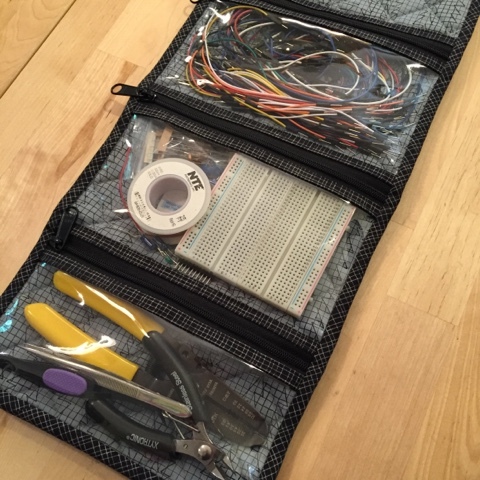 With 4 yards of zipper tape and 16 pulls included in the package, I can almost always make multiple projects from one (the A Place for Everything bag is the big exception to this for me). I don't have much to really add to this section other than the fact that I love Clover Wonder Clips. I love Annie's tip for using basting tape. The only thing that I do differently is to use Wonder Tape instead of basting tape. Why Wonder Tape? It can be removed with water, and I find that it gums up the needle less than basting tape because it's less sticky. Any sticky stuff on the needle is easy to clean off (I normally will wipe it off with a little bit of rubbing alcohol). Another great post. The only thing that I really do differently is to attach the binding to the right (front) side of the zipper instead of from the back. I feel like I get a more even edge that way. So, that's it for me on part two of my recap (days 6-10 of the Sew Along). How are you feeling? I hope you are having fun with this super fantastic little bag. I know that I have. I love them so much that I've already made 3 (as of when I'm writing this post), and I have 4 more to make as gifts. If you haven't done so, be sure to head over to Annie's blog and snag a copy of the free pattern (before October 1). While you're there, check out the official Sew Along posts. I'll be back in a few days again with more comments from the peanut gallery!